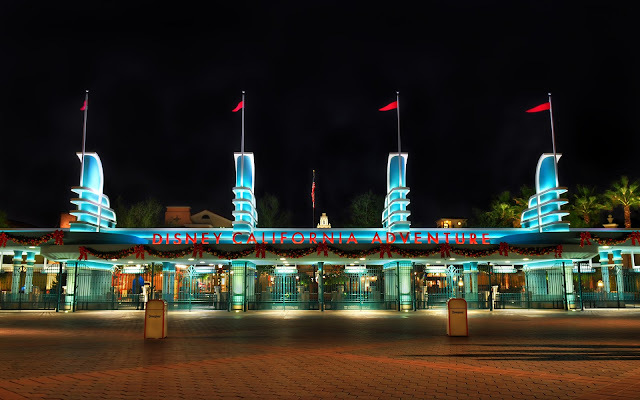 This shot is probably familiar, both because the entrance to Disney California Adventure serves as the banner of this blog, and because I posted the non-holiday version of this a few months ago. For Christmas, the entrance is sharply dressed in wreaths and ribbons. It's not over the top, or glistening with lights, but it's nice. Quiet, elegant, understated, but inviting. Just like Buena Vista Street! The entrance to DCA during the holidays. Don't forget! You can now access this blog by omitting the ".blogspot" part of the URL and simply typing in DisneyPhotoblography.com or www.DisneyPhotoblography.com! This should hopefully make it easier to tell you friends all about this awesome site where you can see beautiful Disney park photos!